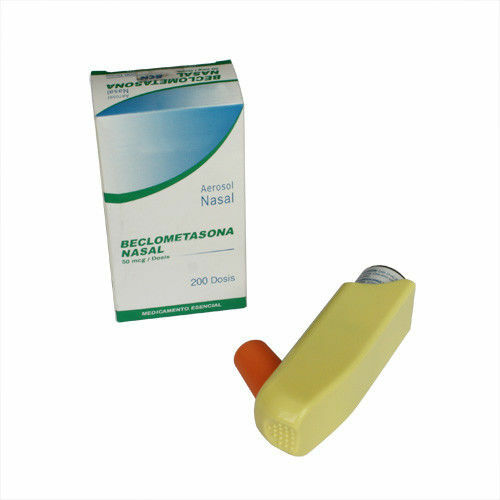 Beclomethasone Dipropionate Nasal Aerosol is a pressurized, nonaqueous solution in a metered-dose aerosol device intended ONLY for intranasal use. It contains a solution of beclomethasone dipropionate in propellant HFA-134a (1,1,1,2-tetrafluoroethane) and dehydrated ethanol. Each actuation delivers 50 mcg of beclomethasone dipropionate from the valve. Each canister contains provides 200 actuations after priming. Used in the maintenance treatment of asthma as prophylactic therapy in patients 5 years of age and older, and in treating symptoms for allergic rhinitis (seasonal or perennial) in patients 12 years of age and older. Also being investigated for oral treatment in mild-to-moderate Crohn's disease of ileal or ileal-right colonic localisation and for "topical" use mild-to-moderate graft versus host disease. Beclometasone, a synthetic halogenated glucocorticoid with antiinflammatory and vasoconstrictive effects, is used for treating steroid-dependent asthma, allergic or nonallergic rhinitis, or recurrent nasal polyps. Unbound corticosteroids cross cell membranes and bind with high affinity to specific cytoplasmic receptors. The result includes inhibition of leukocyte infiltration at the site of inflammation, interference in the function of mediators of inflammatory response, suppression of humoral immune responses, and reduction in edema or scar tissue. The antiinflammatory actions of corticosteroids are thought to involve phospholipase A2 inhibitory proteins, lipocortins, which control the biosynthesis of potent mediators of inflammation such as prostaglandins and leukotrienes. For the investigated use in the treatment of GvHD or Crohn's, beclometasone acts by binding to interleukin-13 to inhibit cytokines, which in turn inhibits inflammatory chemicals downstream.